This card marks my first artist collaboration. Kristian from kcdesignz.com contacted me with some cool suggestions for cards. One of them was for a Bubba Newman card from the 1980 TV movie The Comeback Kid. This was a movie I'd never heard of before. I YouTube'd it and began watching. Within maybe 5 seconds I knew this was a card I'd be making. I ended up watching the whole movie and now have my eye out for a VHS copy to add the the library. The image I most wanted to use for the card was the one on the VHS slip cover. Problem was there was a lot of other stuff that I'd have to remove before it was card ready. I simply mentioned this to Kristin and before I knew it he e-mailed me a masterfully edited picture. The guy is quite the pixel wrangler, and that saved me a ton of time. 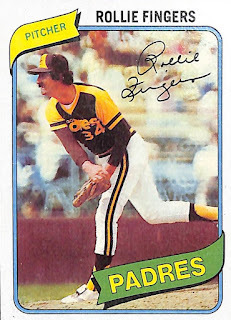 For the card I went with the 1980 Topps baseball design. This was a first for this template, although it had been on my radar for some time, it was just that nothing from 1980 quite piqued my interest enough. I used a San Diego Padres card for the card's colors as the fictional minor league San Jose Stallions shared their uniform colors. Regretfully this is another card I have no chance of getting signed. I love John Ritter. When I was a kid I didn't get all the double entendre humor that was Three's Company. I was just a dumb kid. It wasn't until I watched reruns later in life that I realized how brilliant of a comedian John Ritter really was. Actually, I don't want to say 'no' chance ... I'm going to try my luck wit Ritter's co-star, Susan Dey, also pictured on the card. Also, I enlisted Kristian's skills a second time for some help on a preexisting card. I'll be updating that post and this one soon with our results.